Viljee and Hanlie Keller invite you to the comfort of their hospitable Cape Dutch style home, set on a working ostrich and alfalfa farm only 10 km outside Oudtshoorn. Stylish air-conditioned bedrooms have a separate or private entrance and overlook the sparkling swimming pool set in the garden with a panoramic view of the Swartberg mountains. 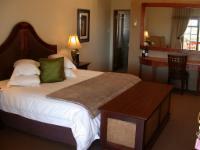 The bedrooms include heaters, satellite television, clock radio, honesty bar and tea tray. Romantic candlelit dinners. Picnic baskets on request. Enjoy a personal ostrich farm tour. Ideal for families, groups and business travellers. WiFi hotspot. "Lovely location not far from Cango caves and Highgate ostrich show - both well worth a visit. It was lovely being close to the ostriches. We were very well looked after and had a delicious evening meal outside. Breakfast was good too with scrambled ostrich egg. Would definitely recommend staying here." 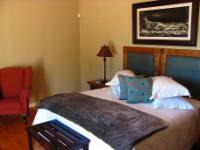 "We just stayed for 1 nite on our way from Wilderness to Stellenbosch. The room was really fantastic as well as the premises, in general. Cosy place. Dinner was served in candle lit as there was no power. It rained very heavily which damaged power station nearby. However, the service was good. Could go again. ."
Take the N1 to Worcester. From there, take the Route 62. Just before you reach Oudtshoorn, turn right to Mossel Bay (R328). left). Drive 1,6 km and Mooiplaas Guest House will be on your left. Take the N2 from Cape Town direction George / Oudtshoorn. The sign board will say George/PE. Turn left to Hartenbos / Oudtshoorn. Follow sign boards to Oudtshoorn. Drive over the Robinsons pass, about 10 km before Oudtshoorn, sign boards on the left. Turn left to Mooiplaas Guest Houses (same direction as Highgate Show Farm). Drive the N2, turn towards George. Take turn off to Oudtshoorn. Drive into Oudsthoorn. Turn left at first traffic light, on R62. Turn left to Mossel Bay (R328). After 8 km, turn right to Volmoed. Mooiplaas Guest House is 1,6 km on left. Mossel Bay. Drive 8 km, past Safari Ostrich Show Farm. Go over the Olifants River Bridge, up the hill and turn right to Mooiplaas Guest House (sign board on the left).